At just 2-1/4 inches in height, while isolating vibrations as low as 1 hertz, the new completely-passive Negative-Stiffness tabletop vibration isolation platform – developed by Minus K Technology – provides the industry’s thinnest low-height, low-frequency isolator for optimizing space in critical microscopy and laboratory applications. 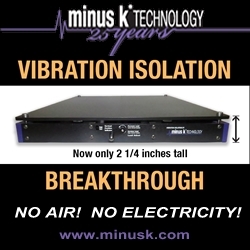 Inglewood, CA, March 14, 2019 --(PR.com)-- Minus K Technology (Minus K) has just released its latest Negative-Stiffness vibration isolation platform – the ultra-thin, low-height model CT-1 passive isolator – designed for low-frequency vibration isolation in critical micro- and nano-microscopy applications where space constraints are critical. The completely passive tabletop unit is just 2-1/4 inches in height, yet delivers 1/2 Hz vertical natural frequency, and 2 to 2-1/4 Hz horizontal natural frequencies – considerably more low-hertz vibration isolation performance compared to air tables and active systems. Image 1: The new Negative-Stiffness CT-1 ultra-thin, low-height, low-frequency vibration isolation platform mitigates space constraints in microscopy applications. Negative-Stiffness isolators employ a unique and completely mechanical concept in low-frequency vibration isolation. They do not require electricity or compressed air. There are no motors, pumps or chambers, and no maintenance because there is nothing to wear out. They operate purely in a passive mechanical mode. The Negative-Stiffness CT-1 isolator achieves a high level of isolation in multiple directions. It has the flexibility of custom tailoring resonant frequencies vertically. The transmissibility of the CT-1 is substantially improved over air and active isolation systems. When adjusted to 1/2 Hz vertical natural frequency, the CT-1 Negative-Stiffness isolator achieves approximately 93 percent isolation efficiency at 2 Hz; 99 percent at 5 Hz; and 99.7 percent at 10 Hz. Negative-Stiffness vibration isolation systems have become a growing choice for micro- and nanotechnology microscopy applications. Not only are they a highly workable vibration solution, but they provide location flexibility and portability that other vibration isolation systems cannot. Minus K® Technology, Inc. was founded in 1993 to develop, manufacture and market state-of-the-art vibration isolation products based on the company’s patented negative-stiffness technology. Minus K products are used in a broad spectrum of applications including microscopy, nanotechnology, biological sciences, semiconductors, materials research, zero-g simulation of spacecraft, and high-end audio. The company is an OEM supplier to leading manufacturers of scanning probe microscopes, micro-hardness testers and other vibration-sensitive instruments and equipment. Minus K customers include private companies and more than 300 leading universities and government laboratories in 51 countries. Click here to view the list of recent Press Releases from Minus K Technology Inc.